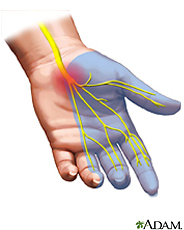 Carpal Tunnel Syndrome (CTS) is the scourge of anyone who works with their hands. It is most commonly a repetitive stress injury, meaning it’s caused by doing the same actions over and over. It can also be caused by trauma or edema in the wrists, but most often it’s attributed to flexing and extending your wrists too often without administering any self-care techniques, like ice if it’s inflamed, heat if it’s achy, or self massage and stretching. 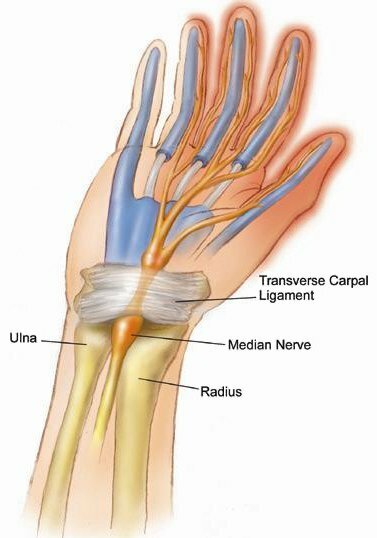 The carpal tunnel is the small space at the base of your hand, just a smidge beyond the wrist crease and right in between the two pads (the thenar eminence and hypothenar eminence) of your palm. The base of this tunnel is, of course, made up of your carpal bones, and the roof is the flexor retinaculum, aka the transverse carpal ligament (in pictures it looks like a strip of masking tape going across your wrist). In this tiny amount of space travels ten structures. Nine of those structures are tendons for muscles that move your fingers, thumb and wrist. The other structure, and the most superficial of the bunch, is your median nerve, which is what gets compressed with CTS, and what causes pain into your lateral three and a half digits (your thumb, index finger, middle finger, and lateral half of your ring finger). The pain from CTS is a nerve pain, which means it can range from numbness and tingling to a shooting electrical pain. It is often described as a “painful numbness” that wakes you up at night, and in fact one of the main complaints of CTS sufferers is lack of sleep. People who work at a computer all day are susceptible, especially if their workspace is not ergonomically correct. Musicians, barbers, waiters, butchers, and even (eek!) massage therapists are all prone to CTS. And incidentally, the “Syndrome” part of that is very important. If someone ever tells you, “Aw man, I got carpal tunnel,” just nod at them, and tell them you have two also. Everyone has carpal tunnels. It’s when there’s compression of the nerve that you have Carpal Tunnel Syndrome. If you had a broken leg you wouldn’t go around telling people, “Aw man, I got a shin bone.” You’d have to mention the broken part for that to be special. So how do we prevent this? If you can, keep your wrist in a neutral position, not flexed or extended, while working. If CTS-like pain starts to develop, stop doing what you’re doing and start stretching out your wrist. The easiest stretch is to grab your fingers and pull your hand back into extension. This will stretch all the problem flexor muscles in the carpal tunnel and hopefully alleviate some of your discomfort. You can also grab all the tissue just below the wrist and stretch it down towards your elbow to take the slack out of it, and then start rotating your wrist in circles. This will help to loosen any fascial adhesions around your wrist and over your carpal tunnel. Or get a massage! A good massage therapist (aka, a Soma grad) will know what muscles to target to relieve your pain and how to reduce fascial adhesions around your wrist. Surgery is also an option in severe cases, but the success of the surgery will depend upon many factors, such as how your scar tissue forms and if you stop doing the actions that caused CTS in the first place. Oftentimes people get the surgery and are back at the doctor’s office a few months later with the same pains. So it’s best to just prevent CTS and avoid the surgeon altogether.